Metalfab has designed and manufactured a dual-outlet, heavy-duty volumetric feeder that, in conjunction with the company’s Posibin, meters powder with near gravimetric accuracy. This combination eliminates the need to disassemble upstream and downstream equipment to reclaim unused powders remaining in the bin or silo. Material handling process materials can be expensive, making inventory control critical. Until now, unused materials were often forfeited in lieu of the expensive downtime required to reclaim it. The HDV feeder makes reclaiming material fast and easy with no disassembly required and no downtime. 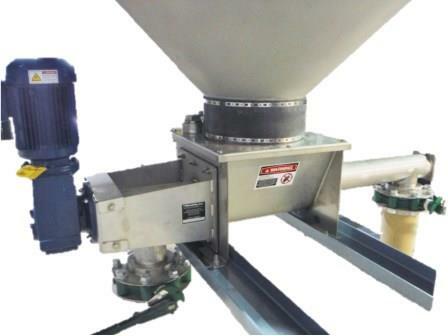 The HDV reversible screw feeder can be reversed with the flip of a switch, allowing the contents of a bin or silo to be emptied into a bulk bag or drum. The material can be used in another process or received back into inventory. Standard features include: heavy-duty stainless steel construction; 2B mill finish; sizes from 4-16 in. with manual or automated discharge valves on each outlet.